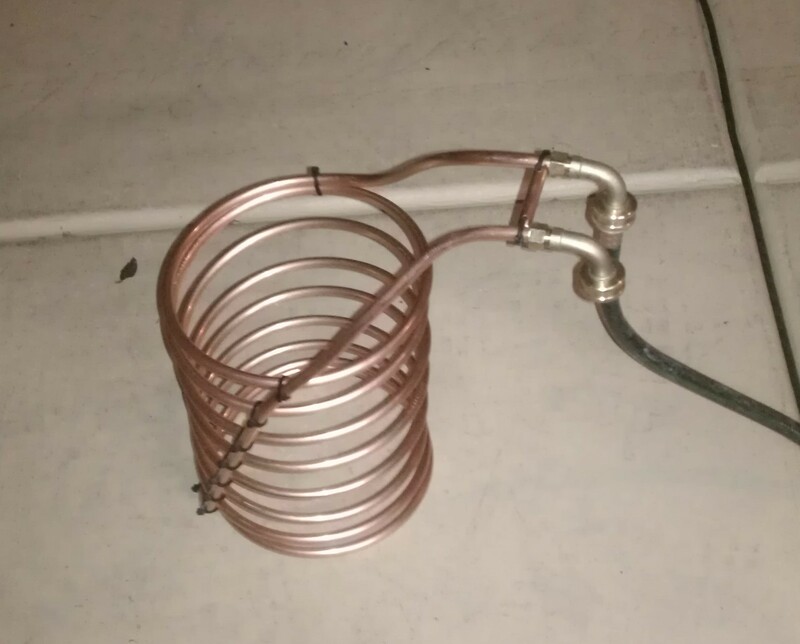 An immersion wort chiller is the go-to, cheap method for cooling after the boil when homebrewing. It's an absolute necessity to get your wort cooled down after the boil as fast as possible for many reasons, including limiting the chances something bad is going to get in the beer before fermentation. Creating this is definitely one of the more simpler DIY brewing equipment projects. Simply get some copper tubing and wrap it around something round that would fit in your boil kettle. In my case, I just used a korney keg. Then, attach some compression fittings to the copper tubing for connecting up a water hose to each end. Using this takes two water hoses. One connected up to a ground water source and the other draining into a safe place. Be aware that the initial water that will go through this will come out very hot. Unless you want to exterminate some wildlife, I would suggest not draining this on your lawn.